nicknamed "Monty" and "The Spartan General"
One of the most interesting families to live at Bishopscourt was the Montgomery family. The house changed considerably during a major building phase in 1889 in preparation for the arrival of a new bishop, Bishop Montgomery, and his family at the height of the British Empire. One of the children, Bernard Montgomery, 1st. Viscount Montgomery of Alamein (Monty), became a noted British Commander and hero, but his childhood in Tasmania is not so well known. Field Marshall Montgomery of Alamein spent his childhood in Tasmania, and the ideas and attitudes he formed during those crucial years stayed with him all his life. He was the third son of Henry Montgomery, Bishop of Tasmania from 1889-1901. 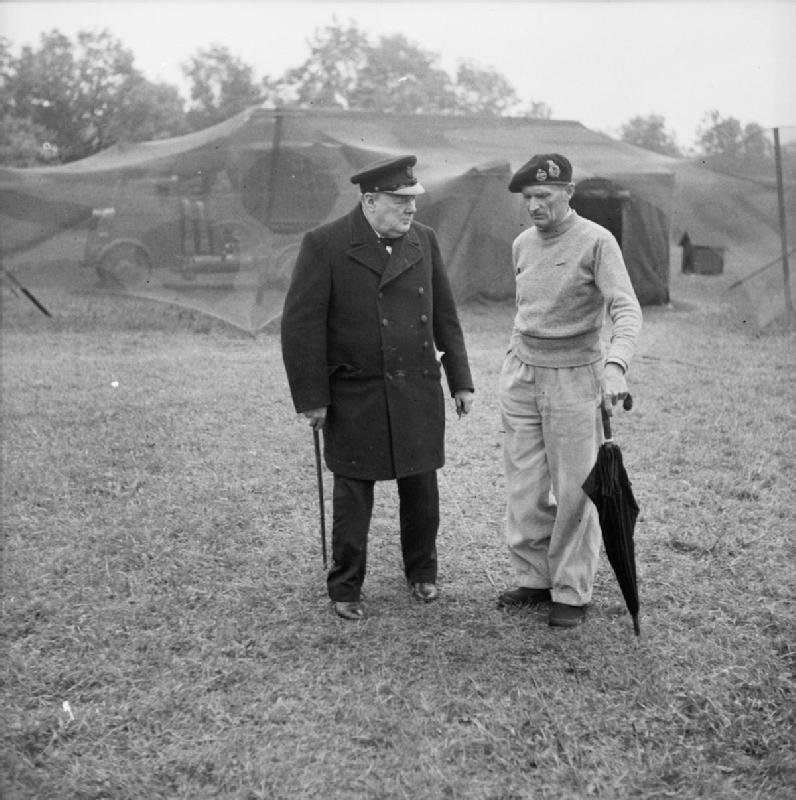 Monty went on to become the most successful British General of World War II. He never lost a campaign. He had a difficult relationship with his mother. Read about Monty, the Black Sheep, and his Mother. Field Marshal Bernard Law Montgomery, 1st Viscount Montgomery of Alamein, KG, GCB, DSO, PC, DL (17 November 1887 – 24 March 1976), nicknamed "Monty" and "The Spartan General", was a senior British Army officer who fought in both the First World War and the Second World War. He saw action in the First World War as a junior officer of the Royal Warwickshire Regiment. At Méteren, near the Belgian border at Bailleul, he was shot through the right lung by a sniper, during the First Battle of Ypres. He was nearly buried alive, as recounted by his mother. He returned to the Western Front as a general staff officer and took part in the Battle of Arras in April/May 1917. He also took part in the Battle of Passchendaele in late 1917 before finishing the war as chief of staff of the 47th (2nd London) Division. One month after the infamous Burning of Cork by the Black and Tans in December 1920, Montgomery was appointed Brigade Major of the British Army’s 17th Infantry Brigade stationed in the city. Their task was to carry out counter insurgency operations during the final stages of the Irish War of Independence. The brainchild of Winston Churchill, the Black and Tans were mercenaries that became known for their attacks on civilians and civilian property, terrorising the Irish people. At 7 pm on the evening of 16th May 1922, led by Major Bernard Montgomery, the last 400 British soldiers marched out of the barracks, on to the Old Youghal Road and down Summerhill to embark on the SS Classic. It marked the end of 116 years of occupation of the barracks by the British army and the end of 750 years of British garrisons in Cork. Montgomery married Elisabeth Carver (nee Hobart) who was the sister of Percie Hobart KBE, 79th Armored Division. Sadly, in 1937, Betty contracted septicaemia and died. The loss devastated Montgomery, and he buried himself in preparations for the war, and was promoted to Major General in 1938. During the Second World War, Monty commanded the British Eighth Army from August 1942 in the Western Desert until the final Allied victory in Tunisia in May 1943. "Now this is not the end; it is not even the beginning of the end." Read more about this epic battle. Monty subsequently commanded the British Eighth Army during the Allied invasion of Sicily and the Allied invasion of Italy. He was in command of all Allied ground forces during Operation Overlord from the initial landings until after the Battle of Normandy. He then continued in command of the 21st Army Group for the rest of the campaign in North West Europe. As such he was the principal field commander for the failed airborne attempt to bridge the Rhine at Arnhem, and the Allied Rhine crossing. On 4 May 1945 he took the German surrender at Lüneburg Heath in Northern Germany. He was of the opinion that if the British had gone on the rebellion could probably have been quashed, but thought it would have broken out again the moment the troops were removed. The Black and Tans mainly comprised unemployed World War 1 veterans willing to "face a rough and dangerous task", helping to boost the ranks of the RIC in policing an increasingly anti-British Ireland. They were not subject to strict discipline in their first months and, as a result, their deaths at the hands of the IRA in 1920 were often repaid with arbitrary reprisals against the civilian population. In the summer of 1920, the Black and Tans burned and sacked many small towns and villages in Ireland, beginning with Tuam in County Galway in July 1920 and also including Trim, Balbriggan, Knockcroghery, Thurles and Templemore amongst many others. In November 1920, the Tans "besieged" Tralee in revenge for the IRA abduction and killing of two local RIC men. They closed all the businesses in the town, let no food in for a week and shot dead three local civilians. On 14 November, the Tans were suspected of abducting and murdering a Roman Catholic priest, Father Michael Griffin, in Galway. His body was found in a bog in Barna a week later. From October 1920 to July 1921, the Galway region was "remarkable in many ways", most notably the level of police brutality towards suspected IRA members, which was far above the norm in the rest of Ireland. On the night of 11 December 1920, they sacked Cork, destroying a large part of the city centre.